Essential holiday phrases: Beginners in Spanish will find in this website a good starting point where they can learn some basic words and sentences in Spanish such as "Hello", "my name is" or "I speak a bit of…" A plus is that you can also listen to the pronunciation of each word in Spanish. 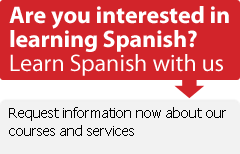 Spanish English vocabulary: is another section where you can learn words in Spanish, it includes English translations. Online Spanish Course: 20 minutes are enough to improve your Spanish every day with this free course online. The course is for beginners in Spanish. Audio Magazine: For intermediate students of Spanish. Listen and practice with this newsletter. And don't miss this excellent Spanish soap opera online where you can decide what will happen next!